Content submission sites can garner a fair amount of traffic for a website. So it's good to know where your content stands the best chance of reaching the widest audience. Compete.com has returned new traffic results for March 2009, and the numbers suggest that most of these sites are doing extremely well, meaning they are still viable - if not essential - places to market brands, products and services. Of course the first focus should always be on your company, but you will want to take advantage of free promotional services. Digg.com remains strong, getting more than 36 million visits per month, according to Compete. For the year, traffic at Digg is up 71.5 percent. The attractive part of Digg is that it is widely used, both in and outside of the Web professional industry, meaning that you have a good chance of making an impact with consumers, not just fellow marketers. The down side is that the very structure of Digg caters to those with connections and those who know how to make the system work for them. Otherwise Digg can take a lot of effort and time to be truly effective. Twitter is far and away the fastest growing network online, both in terms of traffic and overall industry buzz. The site is up to 14 million uniques per month, up from 8 million last month (a 76 percent increase) and up more than 1,200 percent this year. There's no denying that Twitter is an important place to submit content, or at least have a presence. Be sure to take advantage of URL shortening services like bitl.y, cli.gs, or budurl to track how (and if) your content spreads through Twitter. 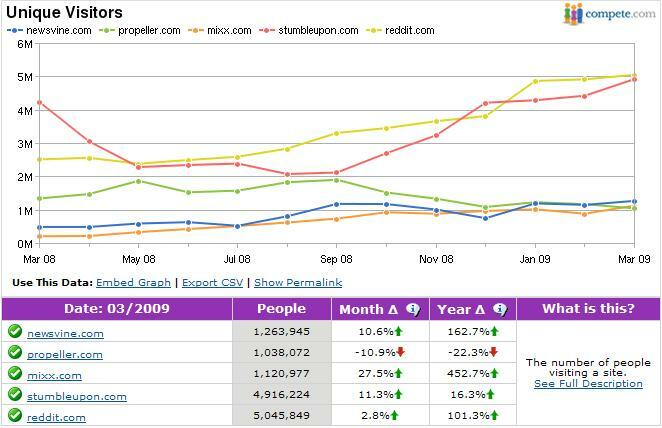 Reddit holds the overall edge, in both traffic numbers and growth, closely followed by StumbleUpon. It's also interesting to see that Reddit has a very steady growth pattern, usually indicating a site with staying power. Also note that all but one of these services (Propeller) is experiencing growth. And while the numbers of any of these sites might suggest it's simply not worth the effort in comparison to Digg or Twitter, it could be argued that while these sites are growing, now is a good time to get involved and stake your claim. It should also be noted that StumbleUpon, while used as a submission site by many, is not necessarily intended to be a content submission site. It might fall under the category of content discovery. And, for that matter, Delicious.com could fall into that category as well. Delicious had over 1.8 million unique visits in March, a 13 percent boost from February 2009. Submitting content to these sites and establishing a reputable presence (including networking and making influential friends) can take an extraordinary amount of time. Sometimes too much to be worth the return. Therefore, it's always important to use your analytics to closely monitor the returns you are getting for your efforts. If you see that site visits from one particular network are resulting in high bounce rates, limited time-on-site or any other factor detrimental to your overall goals, don't be afraid to jump ship. Or find the network(s) with the highest return toward your goals and focus on those instead.